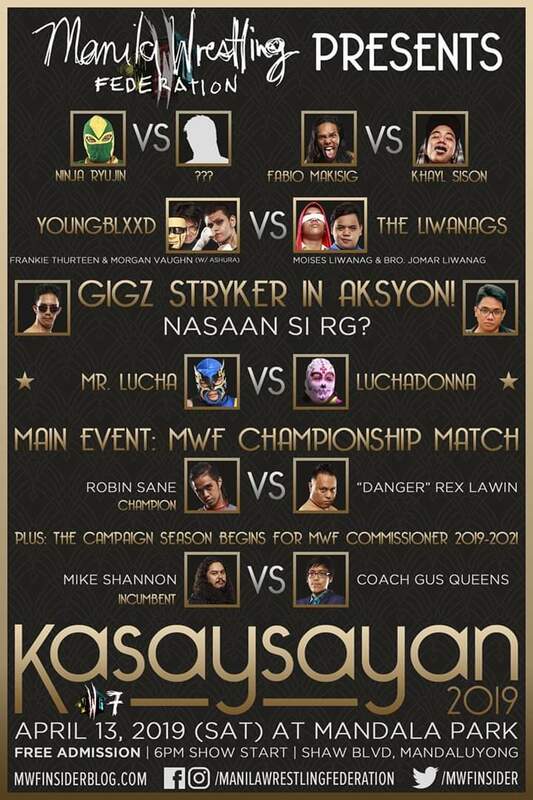 Marks and smarks, your boy, The Migz, is here at Mandala Park for MWF's first show of the year, MWF 7: Kasaysayan. Black Shirt Trainee defeated Blue Shirt Trainee. Khayl Sison defeated Fabio Makisig via submission. "Danger" Rex Lawin attacked Fabio after the match. Sison made the save after the match. Youngblxxd attacked Lawin after and cut a promo on him. Mr. Lucha came out to cut a promo. Coach Gus Queens interrupted him for an exchange of words. Commissioner Mike Shannon announced that the previously scheduled Ninja Ryujin match will not be taking place due to unforseen instances. A match featuring MWF trainees will be taking place instead. Red Shirt Trainee went over White Shirt Trainee via pinfall. Youngblxxd (Morgan Vaughn and Frankie Thurteen) won against Bahay ng Liwanag (Moises Liwanag and Jomar Liwanag). Gigz Stryker came out to attack and distract Moises. Bahay ng Liwanag recovered post-match and laid Gigz out. Coach Gus Queens came out to interrupt a Robin Sane promo. Commissioner Mike Shannon and Coach Gus Queens had a heated confrontation in-ring. Mr. Lucha defeated Luchadonna in the Co-Main Event of the night. It was announced through a vignette that Tajiri will be competing at MWF 8. Robin Sane retained against Rex Lawin in a brutal bout. And that's it for the show. Did you like the results? Are you excited for Tajiri competing on MWF's next show?